Illinois Republican State Convention Poster supporting campaign for House Republican Leader Lee A. Daniels. Mr. Daniels served as a member of the Illinois House of Representatives for the 46th District from 1975 to 2007. He was Speaker of the House from 1995 to 1997, was Republican Leader from 1983-2003 and served as Special Assistant Attorney General for the State of Illinois from 1971 to 1974. 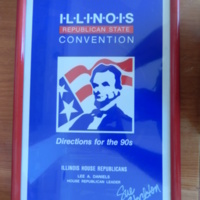 “Illinois Republican State Convention Poster,” UIS History Harvest, accessed April 19, 2019, http://uishistharv1.uis.edu/items/show/164.